It’s been over a week since my last run. Instead, I’ve cooped myself up in my room, which is starting to look more like a cave with each passing day. As I sat here at my desk gazing fondly at the sunshine outside, I had a flashback to junior high track practice when I first started running distance. During practice, I would always run with the sprinters, trying to keep up with them during their 200 meter workout while I still had another lap to go (yeah, I’m kind of competitive). My coach would look at me and laugh, exclaiming “You’re toast!” And he was right, I was completely worn out. Although I learned to pace myself throughout years of running high school and collegiate track, I’ve kept this sixth-grade mentality in other aspects of my life. Like during these last few weeks before I graduate. But how do you avoid burnout when you are going to classes, working on homework, finishing up your senior portfolio, working part-time, involved with student organizations and looking for a job (with the potential of possibly relocating)? As I mentioned before, I run to relieve stress and refocus my energy. It’s also convenient because you can just put on your shoes and hit the pavement for 30 mins. Though running is my activity of choice, there are ways you can get physical such as biking, rollerblading or even going for a quiet walk. …or 15. It’s easy to forget to schedule breaks when you’re in the zone. Even though you’re on a roll, you’re going to crash faster if you try to do it all at once. Pick up a magazine or book, take a shower, go play a video game, stalk your friends on facebook, or anything that takes your mind off what you’re doing for at least five minutes. You’ll feel refreshed and be better off in the longrun. A lot of my friends say they forget to eat when they get busy (not the case for me, I eat even MORE when I’m stressed, and junk food at that). However, you need to eat to keep your brain in check. There are certain foods that may enhance your productivity and brain power. Mark your calendar to countdown the days you have left until graduation. This will be helpful for all of you “I work best under pressure” types (I’m guilty) because you give yourself a deadline (or as I like to refer to as D-Day) to watch creeping closer and closer. It also works for those “Plan everything 3 weeks in advance” types because, well, you sorta are. The bottom line is that time management is critical when you’re working hard. It also helps put the time into perspective so you can plan accordingly in order to avoid burnout. Scream, cry, shout. Find a punching bag (or a pillow) or find some old papers to rip to shreds. The point I’m getting to here is that burnout can be frustrating. It’s best to let it out before it gets the best of you. If you’re more of the laid back type, you may want to sing or draw if raging out isn’t your bag. What are some ways you avoid burnout when you are overwhelmed by school/work/life? Are You Ready to ROCK (Your Interview)? As graduation draws near, many soon-to-be grads are applying for internships and entry-level jobs for the summer. Many will get lucky and land an interview, spending days (or even weeks) preparing for that one-shot at making a good impression. But what do you do in that final hour before the interview? For me, that final hour was literally a 60 minute drive left alone with my thoughts. Or rather, a perfect chance to psych myself out and over think every possible situation that could happen during the informational interview and writing/ editing test that would ensue for the next few hours. What if I blanked on basic rules of AP Style during the editing portion? What if I had writer’s block (an illness I’ve been recovering from lately) during the writing test? What if clammed up and was completely out of character from my usual bubbly self? What if I was put on the spot and the only words that come to mind are “I don’t know?” Or even WORSE – what if one of many bodily functions blindsided me while I was there?! As my life going down the drain flashed before me, a glint of something shiny on the floor caught my eye. Quickly I reached down, taking my eyes off the road for ONLY a second (I swear!) and struck gold: an ’80s mix CD I had compiled last summer. Immediately I popped the CD into the player and cranked the volume as loud as it would go without making my ears bleed. Belting out the lyrics in the comfort of my car erased all of the if’s, and’s or but’s from my mind. Dance moves (though limited in the confines of a moving vehicle) and head bobs included. Then it hit me: I am Dwight Schrute from The Office. Okay, maybe not quite, but I can at least relate. If you watch the video clip below, you will see Dwight take a moment alone in the car to vigorously listen to Motley Crue’s “Kickstart My Heart.” *I know embedding is disabled, click on it again to go to this clip on YouTube. It’s 25 seconds long. Just do it! At this point you may be asking yourself, “Okay Mikinzie, you are a huge geek and I’m frightened to be driving on the same road as you, but what’s the point?” The point is you need to have your “thing” that will ease your nerves and put any doubts in yourself to rest. Whether that means dancing it out, meditating, writing down all of your accomplishments on paper, looking at old pictures of fond memories or even letting your voice crack to bad ’80s music is up to you. In the end, whatever you do needs to inspire self-confidence. Even if that means getting funny looks from other drivers on the highway. What do you do to get rid of the first-interview jitters? I’d like to introduce you to March’s PRepster of the Month, Stephanie Majercik. 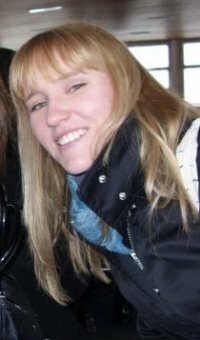 Stephanie is a senior at Canisius College in Buffalo, NY graduating May 2010 with degrees in Communication Studies, German and European Studies. She is currently the media relations intern with buffalofutsal and Concert chair/event planner extraordinaire on the Student Programming Board. Connect with her on Twitter, LinkedIn and check out her blogging debut, The Blonde Experience. Most students have realized by now that an online presence is helpful during their job search. Some of them have even remodeled their Facebook profiles to appear more professional than the typical college student. Many students, myself included, have recognized Twitter’s potential for networking during their job search. Like other social networking sites, Twitter is a tool; every tool has a purpose. When used correctly, tools do their job very well. When used incorrectly, tools can have adverse effects. I’ll admit: I’ve learned what not to do when it comes to using Twitter as a job search tool because I’ve used it incorrectly in the past. Twitter has been much more useful to me since I’ve stopped hiding and started contributing. I can only imagine that it can work for others this way too. 1) Thou Shalt Not Block Your Tweets. Blocking your tweets prevents you from joining the conversation. I used to have my tweets blocked, but realized when I participated in the first #PRStudChat that nothing I tweeted was being seen in the tweet stream. Because they weren’t my followers, they couldn’t see my tweets, and because they couldn’t see my tweets, how could they know I would be a value to their following? The same applies to the job search. For one, companies and professionals you tweet at won’t see your tweets if they aren’t following you. And if they can’t see your tweets, there really isn’t an incentive for them to know if you would be worth following. So in order to ensure that your ideas are really heard, unblock your tweets! 2) Thou Shalt Keep Your Tweet Stream Holy. We all like to update our statuses to tell others what we’re up to, which is fine every now and then, but I find the true value of Twitter to be interacting with others. I was looking at a friend’s Twitter page the other day and all that was tweeted were statuses like “Updating my resume” and “On the job hunt.” There are no links posted and no @replies to other tweeples. If you’re not interacting or sharing with others, then where is the incentive for employers to follow you? You guessed it: there is none. But what happens when your social media friends become your real friends? Last week during my trip to NYC and New Jersey, I met Patrick Johnson, Deirdre Breakenridge and Valerie Simon, Brittany James and PRCog (no, I still don’t know his real name) for the first time. Even though I had never met any of them before, their friendship was very real to me. They’ve helped me out without expecting anything in return; I’ve done favors for them in return anyways; And I’ve gotten to know most of them beyond their Bio (read: things that they don’t typically tweet about). Meeting them in-person just reinforced those feelings of friendship. And it showed: there were no handshakes, just hugs. In the end, I found out that each one of them was even more wonderful in person than their online persona. But what is the difference between a social media friend and an IRL friend, and how do you bridge that gap? Connect with them on more than one social media platform: My SM-friends are connected with me on Twitter, Facebook, LinkedIn, e-mail, Skype/ iChat and via phone. I tend to crack myself up by DM-ing someone on twitter and then switch to text-messaging halfway through the conversation (they don’t think it’s as funny as I do). Be a digital body. Lend an ear, a helping hand and a shoulder to cry on. As I discovered when I asked the question, “Do You Use Social Media to Vent?” people turn to social media for emotional support or a release. Offer sympathy when someone tweets about losing their job, use your knowledge and experience to answer a student’s question about writing a cover letter and give a digital high-five when someone says they are drinking your favorite microbrew. Bottom line: engage. Meet them Face-to-Face: Even though technology enables us amazing social opportunities, there is still something lost between the lines of text on the screen. In order to get a real feel for someone as a person, you have to meet face-to-face. I’ve traveled to Chicago, New York and New Jersey to meet my SM-friends in-real-life. I’m working on finding a way to get myself down to Atlanta, GA. Allan Schoenberg, Director of Communication for CME Group (with whom I’ve met in-real-life several times), also understands the importance of turning connections made through social media into face-to-face friends. However, if you can’t afford the cost or time to travel the nation, find other ways. I like to use Skype’s video chat to “meet” people for the first time. With the same sentiment, Heather Whaling (@prtini) wrote a post on her blog, asking her SM-friends to bridge the gap and schedule a Skype session with her. I dare say that my SM friends are more willing to answer my questions and help me than my non-SM friends. I think this is because social media attracts a niche market: people who want to SHARE. 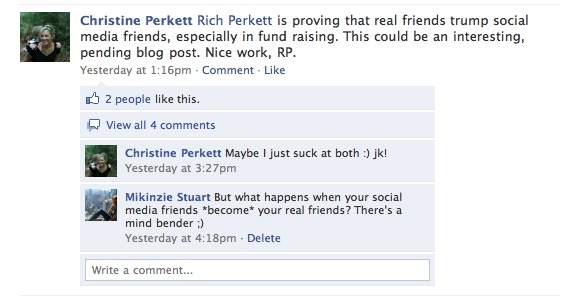 Do you consider your social media friends to be real friends? The American Dream: “Life, Liberty and the pursuit of Happiness.” Or is it? After flying out to New York City for my spring break, I discovered that while I’m looking forward to living my life, flexing my liberties and pursuing the things that make me happy, I simply don’t have the means necessary to actualize my dream at this stage in my life. In the meantime, New York City taught me a new set of ideals: Debt, Booze and McDonald’s. Don’t let debt, or anything for that matter, be an excuse from doing the things you want to do, but keep it within reason. As a poor college student, I knew I was going to have to travel on a budget. Last month was also one of the most overwhelming months I’ve had all year. With little time and little cash, I bought my tickets a week before my trip and after a slight speed bump, had to book my hotel the morning of my flight. However, what ended up being my biggest concern was that two days before my flight, I lost my job. Thankfully it wasn’t performance-based, but rather a time, effort and cost issue. However, I was afraid and apprehensive about going to New York City, one of the most expensive cities in the world, having just lost my main source of income. I realized that I was talking myself out of something that I had been looking forward to since January. Was I being incredibly risky by flying out to NYC after just lost my job? Probably. Was it going to cost more than I had planned? Most likely. Did I get crap from others about it? Definitely. But being cynical and holding yourself back will cost more in the long run. While I’m not advocating the dangers associated with alcohol use, I am most certainly advocating letting go of your inhibitions. Don’t be afraid to jump up on that platform and show the world what a good time you are having while you discover the world. This is why I tweeted live from NYC, creating my own hashtag #MikinzieDoesNYC and made my Facebook photos from the trip public to everyone (while all of my information on Facebook is public, I like to keep photos for friends only). While I wanted to cram all I could in the matter of a few days, I also wanted to enjoy myself and have fun. This is why most nights in the city were unplanned. I let go of the “itinerary” and let whoever I was with at the time grab my hand and drag me to whatever art space, dive bar or pizzeria was in sight. Don’t take yourself or life’s “small stuff” too seriously or else you might forget to enjoy the adventure. Seeing as I was on a budget, I had to remember while living it up, not to live it up too much. I admit it: with all of the famous foods in NYC, I ate a meal or two at McDonald’s. This may sound crazy at first, but I had to remain realistic and remind myself to pick and choose my budget battles. McDonald’s is quick, cheap and predictable; I knew my meal would tide me over for a few hours and cost me under $5. When you’re on a budget and have a ticking clock in your ear, you have to prioritize. You have to find that fine line of not limiting your experience while still being conscious of very real limitations. Lauren Novo is a a senior at Florida State University with a double major in Media/Communication Studies and Creative Writing. Additionally, she serves as the staff writer for Trusteria Services, a regional company in Tallahassee, and as a public relations staff assistant for RB Oppenheim Associates, a local PR agency. 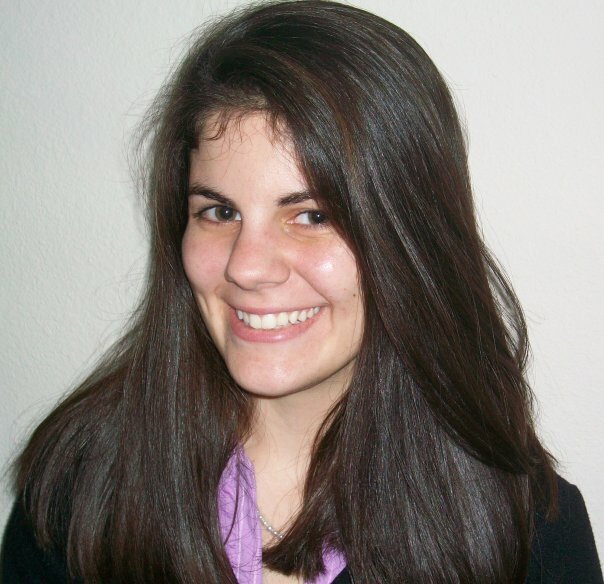 Connect with her on Twitter, LinkedIn and read her blog, Gen-Y PRogress: Lauren Novo’s PR Journey. Many of us are just two months away from the real world. College life is actually coming to an end. Perhaps you’re graduating with top grades and impressive resumes or maybe you’re just barely making it out alive. Regardless, we’re all in the same boat. Those of us who have decided against grad school need to start thinking about securing jobs. Like now. So while seemingly every PR pro, extended family member and teacher asks what your plans are after graduation and your stomach starts to churn because you have no flippin’ idea, just remember this: you’re not alone and it’s going to be OK.
What’s the key to staying calm when you enter an interview (or even “non-interview”) situation and you’ve got competition? Key messages. Think about it – right now, whether you’re learning PR tactics in school or through your internships, you’ve probably noticed how important key messages are to campaigns and initiatives. We are taught that in order to influence thinking and ultimately behavior, our messaging needs to be clear and relatable. We need to be sincere and make people genuinely care. So why not bring these lessons into our own personal, “hire me, please” endeavors? Sit down and figure out who you are, what you want, why you want it and how you are going to accomplish it. If you can’t clearly define your capabilities to a prospective employer, why would you be hired? Go into the interview with your key messages prepared. And no, your messages should not be the same for every interview. After all, messages aren’t going to be the same in every campaign you complete once you’re hired. Consider: What does this agency/corporation stand for? Who does it serve? What does it need from its PR team? Don’t lie about yourself to get the job. Just understand and explain how and why you are a good fit. It sounds silly, making a list of key messages. But that might just set you apart from the others. Not only will it help you understand your own value, but it will help you develop analytical skills for when you receive that first big project at work. I follow 544 people on twitter that do not follow me back. No, I didn’t go through over 1,000 Twitter users I was following to figure this out. I used FriendorFollow.com, a site that tells you who out of those you are following, are not following you back. I used friendorfollow.com for the first time today after Brian Cousins @reply to me. Being a novice tech-geek and twitter-fiend, I immediately went to the site to see how many people I followed weren’t following me back. Did I care? Not really, but there was a part of me that needed to know. As I skimmed across the profile pictures, I became deeply distressed. There were people who weren’t following me who I had tweeted with and a few I had even met in real life! Even though it sounds silly, I considered unfollowing all 544 unfollowers. I even whined via tweets about how I was discouraged by my unfollowers, and began to populate the #onetweetstand hashtag I had created earlier in the week. Then it hit me: this isn’t a popularity contest. Will I cry myself to sleep if these 544 unfollowers never follow me back on twitter? Most likely, no. Then why the hell do I care? Bottom line: I don’t. The people that follow me have their reasons, as do those who decide not to follow me. As long as I continue to share in the mutually beneficial relationships derived from my twitter community, I really don’t give a flip about those who decide not to partake (unless your name is Chris Brogan *wink*). I promptly exited out of friendorfollow.com and do not plan on returning anytime soon.